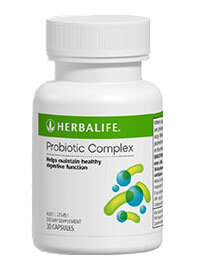 Probiotic Complex has 4 billion probiotic organisms per capsule. Probiotics are micro-organisms that are a good form of bacteria. The digestive system usually includes both 'good' as well as 'bad' bacteria, which needs to be balanced to maintain optimal health. Lactobacilli and bifidobacteria are two probiotics that are most widely studied, and are both included in Probiotic Complex (lactobacillus acidophilis and bifidobacterium longum). Thus, Probiotic Complex helps to maintain healthy digestive function. Lactobacillus acidophilus (13.5mg) – equivalent to 1.7 billion organisms. Bifidobacterium longum (38.5mg) – equivalent to 2.3 billion organisms. Both of these probiotic strains work together in the gut to ensure the growth of good bacteria. Helps maintain healthy digestive function. Assists to restore beneficial intestinal bacteria. Aids, assists or helps in the maintenance of general well-being. Provides friendly bacteria to assist easy defecation. Helps to maintain good gastrointestinal health. Promote the growth of friendly bacteria.